To evaluate the influence of artifacts produced by zirconium implant on the diagnosis of vertical root fracture (VRF) in teeth close and distant to the implant in cone beam computed tomography (CBCT) images. We also determined if kilovoltage (kVp) and metal artifact reduction (MAR) tool could influence this diagnosis. Twenty single-root teeth were divided in control and fractured groups (n = 10). The teeth were randomly positioned in the first and second and right and left pre-molar alveoli of a dry human mandible. CBCT exams were acquired using a ProMax 3D unit with varying kVp (70, 80, or 90 kVp), with or without MAR, and with and without a zirconium implant placed in the alveolus of first right molar. The images were evaluated by five observers. The area under the receiver operating characteristic curve (ROC), sensitivity, and specificity were calculated and compared by analysis of variance with a significance level of 5%. In general, ROC and sensitivity were not affected by the factors studied (p > 0.05). The main effects occurred in specificity; when implant was used without MAR, the values were lower for tooth 45 for all kVps (p = 0.0001). Artifacts produced in the vicinity of teeth with suspected VRF impair the diagnosis by decreasing the specificity, because they can mimic the VRF line generating false positives. However, MAR improves the specificity, being its use recommended when metallic objects are present near teeth with suspected VRF. Since nowadays, many patients who undergo CBCT show implants and they definitively produce artifacts, it is important to evaluate the influence of such artifacts in the diagnosis of teeth that are close to the generator-artifact object. The authors would like to thank the evaluators. 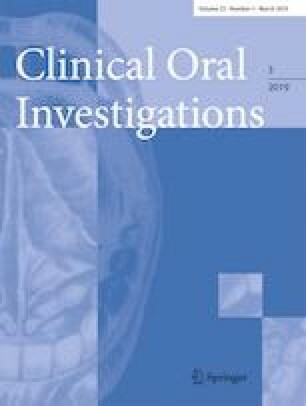 The work was supported by CAPES (Coordenação do Aperfeiçoamento de Pessoal de Nível Superior—Brazil, process number 88881.118874/2016–01) and the Division of Oral and Maxillofacial Radiology, University of Texas Health Science Center at San Antonio, USA. All procedures performed in studies involving human participants were in accordance with the ethical standards of the Research Ethics Committee of the Piracicaba Dental School, UNICAMP (#2.163.038) and with the 1964 Helsinki declaration and its later amendments or comparable ethical standards.